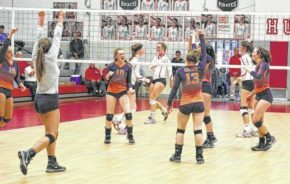 HURON — The Galion Tigers volleyball season is over after a 3-1 loss to the Huron Tigers on Saturday afternoon in the Division II sectional tournament in Huron. Huron dropped the first set to Galion, but hit their stride to advance in tournament play; 23-25, 25-15, 25-17, 25-10. Galion finishes the season at 9-15 and Huron improved to 21-2. Huron will play Margaretta (10-13) on Oct.26 at Seneca East High School in Attica. “To go to Huron and face the No. 2 ranked team in the state, not to mention a volleyball powerhouse, and take the first set from them on their home court is indescribable,” said coach Jaime Valentine. “They went out in that first set knowing they had nothing to lose and played out of their minds. “In the following three sets the experience of Huron took over and eventually prevailed. I told the girls after the match was over that it was one of the most memorable moments of my coaching career,” Valentine said. Morgan Gregory was busy all over the court for Galion against Huron. Gregory was the top server and ball handler for Galion. She was a perfect 14/14 serving with seven points, all while recording all three of the Tigers’ aces for the match. On the attack set up, Gregory was 107/109 ball handling with 28 out of 29 Galion assists. Gregory also racked up 15 digs and a block in her final game for the team. She finishes her final season second in aces on the team with 27 and atop the assists list with 724 of Galion’s 763 assists this season. Captain Callie Wildenthaler, also playing in her final game in a Galion uniform, was perfect on the serve as well. Wildenthaler finished the match a perfect 15/15 from the service line with nine points. Overall, Galion was 68/70 on the serve. Wildenthaler also lad the way for the Tigers’ defense, recording 19 of the team’s 72 digs. Wildenthaler led the team in digs this season, with 339. Senior Chloe McCleese found herself atop team leaders in a few categories, as well. McCleese finished the match with four kills, a block and 10 digs. She finishes the season second on the team in digs with 211. The Tigers racked up 1,283 digs for the year. In her final game, Dusty Thomas went 21/24 on the attack and was second on the team in kills with six . Aleena Truman is the fifth senior on the team. Also on Saturday, Marissa Gwinner was 37/43 hitting with 14 kills and had five block Nicole Thomas recorded 10 digs, Kelsey Redman added two blocks and Gillian Miller finished the contest with a block at the net. Gwinner, a junior, was an important part to the Tigers’ success. She led Galion with 28. Galion finished with 113 as a team. Gwinner recorded 339 of 858 kills and had 88 of the Tigers’ 138 blocks for the year. “I have nothing but high hopes and expectations for the future. We are going to use the off season to heal and get better and be ready to compete next season,” Valentine said.